Is there a better alternative to Rubik Puzzle? Is Rubik Puzzle really the best app in Puzzle category? 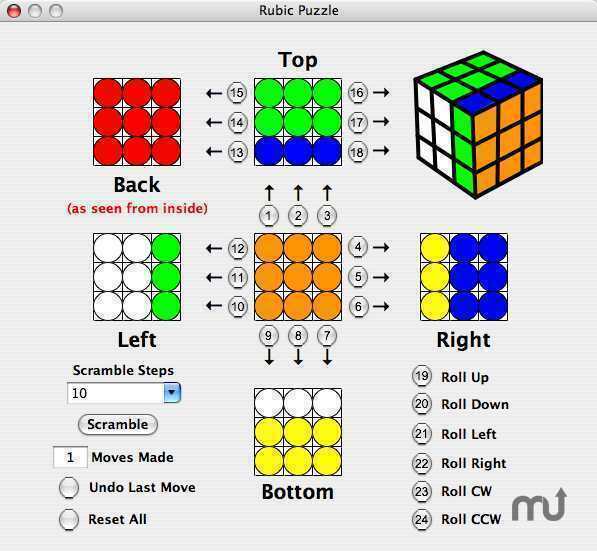 Will Rubik Puzzle work good on macOS 10.13.4? Rubik Puzzle is a computer version of the puzzle popular in the early 1980s. You see a layout of all six sides of a 3 x 3 x 3 cube plus an up-to-date isometric display showing the cube's Top, Left and Front sides. Buttons allow you to rotate any layer or the whole cube. A Scramble feature is provided with depths of three to ten moves. An Undo feature allows unlimited moves backwards. A printable log of all moves is provided. Examples of interesting patterns is included. Sound is supported. Settings for window position, scramble depth and sound are saved between sessions. Rubik Puzzle needs a review. Be the first to review this app and get the discussion started! Rubik Puzzle needs a rating. Be the first to rate this app and get the discussion started!